Hardwood floors can be installed in three major ways. There is the nail down method, glue down and floating method. Each method has its own benefits and times when they need to be used or at least better suited. To understand the installment method and to know how to properly shop for hardwood floors, Sequoia Flooring will explain the different installation methods and when they are best used. Nailing down wood floors has been used for centuries. It was the original method until homes were built on concrete foundations. Today hardwood floors are still nailed down but only one wood sub-flooring. You cannot nail down hardwood floors on concrete or metal floors as in the case of some commercial buildings. Hardwood floors are most popular in multi-story homes with the upper levels using a wood subfloor. Some raised homes have a wooden sub floor which allows for the nail down method. Some installers will manually nail the planks down, but most will use a pneumatic nail gun. Only natural hardwood floors can be nailed down. Engineered, and laminate floors are usually glued down or they use an interlocking method. The glue down method is mostly used for laminate, engineered, or for luxury vinyl flooring. However, occasionally hardwood floors are glued down as well. When a homeowner wishes to install hardwood floors over a concrete subfloor, the wood will need to be glued down. One benefit of gluing down the hardwood floor is that it reduces noise such as echoes, squeaking and the sound of footsteps. Since the planks are glued down with a strong adhesive, the planks don’t move at all. The one down side of the glue down method is if the wood floor will needs to be replaced. Removing glued down hard wood floors can be a difficult task. When choosing the glue down method make sure it is done by a professional contractor. If the wrong adhesive or installation method is used it can void out many warranties. Engineered, laminates, and hardwood floor can also use a floating installation method, which means the floor isn’t secured down by nails or glue. Most floating hardwood floors use an interlocking method which acts as a joint that holds each plank together. Floating hardwood floors often require an underlayment which helps to reduce noise and cushions the planks. Floating is another popular choice for concrete sub-floors when the homeowner doesn’t want to glue down the planks and cannot nail the plank down either. Floating is becoming a very popular choice for a number of reasons such as it is easier to repair and remove damaged planks. It allows for more installation options and can be installed over any surface. It is also one of the cheaper and faster methods of installation. When shopping for hardwood floors, often we are obsessed with the color, texture and pattern of the floor. However, many people never consider how the wood floor is installed. There are number of factors when considering the installation method. When shopping for hardwood floors remember to keep in mind the method you want to utilize, whether it be nail down, glue down, or floating wood floors. If you have more questions about installation and which method is best for you, contact Sequoia Flooring. We provide hardwood floors, installation and maintenance services. To schedule our services, contact or visit Sequoia Flooring today. When you choose hardwood for your flooring choice, you can count on a lifetime of beautiful floors. One of the beautiful things about hardwood is the fact that you can literally erase years of wear and tear from your floors simply by having them refinished. Sequoia Flooring is here to talk about some of the signs that may be present when it is time to refinish your hardwood flooring. Your hardwood floors have to be able to withstand a great deal of abuse. This is especially true when you have young children or pets that are in the home. No matter how careful you are, you will notice that scratches, dings and dents will happen over time to your flooring. When they are starting to look really beat up, you may want to start to think about having the floor refinished. Minor scratching is fine, but when you start to notice deep gouges in your flooring and they are looking old and worn, you can simply have all that abuse erased and they will look brand new once again. As you care for and maintain your hardwood, the polyurethane slowly starts to wear off. In these areas, you may start to notice that some boards start to show signs of gray discoloration. If you don’t have the floors refinished and repaired, this grey color will continue to get darker until the patches are finally black. At that point, you will have two choices, choose a stain dark enough that hopefully it won’t show, or have new boards weaved in throughout and stained to match the rest of the flooring. There are a handful of scenarios that can cause your hardwood to sustain water damage. This is especially true for those that choose to put hardwood in their kitchen areas. Signs of water damage include wood separation, cupping and dark areas. If there isn’t a large amount of water damage, you can have those few boards replaced and the flooring refinished to look the same as the rest. If the damage is significant, you may have to consider having your entire floor replaced. If there are areas of your floor that experience excessive sunlight, you may start to see some fading and dulling over time. This can easily be fixed when you have your floor refinished. Sometimes the damage looks pretty subtle and you don’t realize it is there until you have your floors refinished and realize how dull they actually were. You can avoid this issue by purchasing window coverings that will give your flooring a break during the hottest times of the day. If you need to have your hardwood flooring refinished, no one will give you the superior results that Sequoia Flooring will. 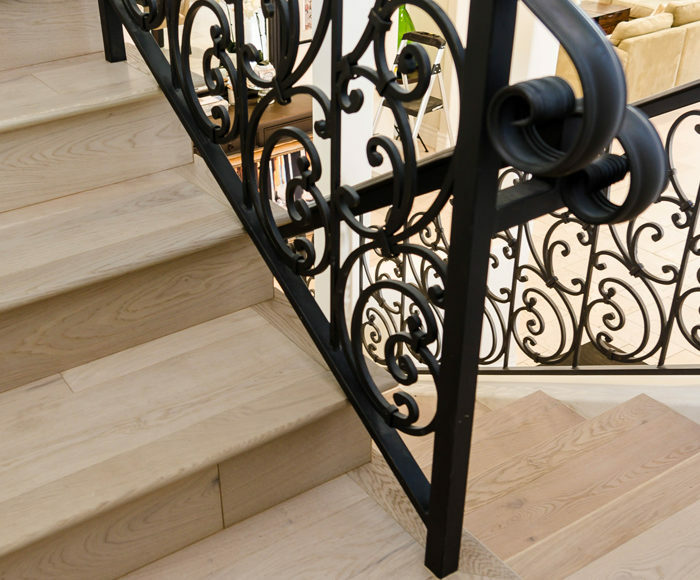 We take pride in our attention to detail and outstanding hardwood floor services. Call us today for all your refinishing needs. There are quite a few options for those looking to install wood floors in their home. Each of the wood species has a specific projected lifespan and their own pros and cons. When it comes to resale value, knowing if it was hardwood, engineered wood, or laminate flooring was enough. Now, prospective home buyers want further details. With this in mind, we at Sequoia Flooring would like to share a handful of the most common wood species used for hardwood flooring in your home. Maple: Maple, is similar to oak, but is darker and harder. For a sleeker, smoother feel, the maple produces the effect with a lighter grain color. Maple is a popular hardwood flooring option in modern homes. However, it is important to know it absorbs stains easier, allowing for more stains and has a tendency to develop a yellow coloring when it is exposed to direct sunlight. Oak: Absorbing stains for easy finishing, the oak is an economical option as it is a strong-grained, and efficient. It is among the top used hardwood flooring in North America. To help retain the luster as they age and in homes where there are kids and pets walking back and forth, this wood is popular because the graining hides flaws, such as scratches and dents easily. Red oak will have the pinkish undertones and white oak will have the gold and brown undertones. Pine: Pine is noted as an allure among homeowners as a hardwood floor option instead of a flaw though it is one of the softer woods on the market. During the installation process, the soft pin is easier to cut and work with, and to boost the wood’s authenticity dents and scratches are minimal. Because as the pine flooring ages the fibers will compress on themselves, the surface becomes harder over time. Bamboo: Bamboo is a very popular eco-friendly choice with its sustainability. Bamboo is technically a grass, and only requires 4 – 6 years for it to mature as opposed to hard woods that take 50 years or more. The hardness is not lost however, as strand woven process leaves it harder than you may think. Bamboo is traditionally a lighter color, but caramelized options are available for those preferring the darker colors. Brazilian Cherry: As the name suggests, Brazilian Cherry is a dark red color that continues to deepen with age. This flooring is very inviting and associated elegance, making it often a requested option for studies or dens. This wood is exceptionally hard, making it very durable. However, due to its hardness, it can be difficult to install and refinish. Cork: Like the bamboo, cork is another eco-friendly selection. As opposed to the wood itself which makes it more sustainable, cork planks are produced from the bark of the cork oak tree. Making it both cushy to walk on and self-repairing from the indentations from furniture, the cork flooring has that same bounce-back feel as the cork boards do. Cork is impermeable to gas and liquid, giving it a natural resistance to mold and mildew; which allows this wood to be used in basements and even bathrooms. 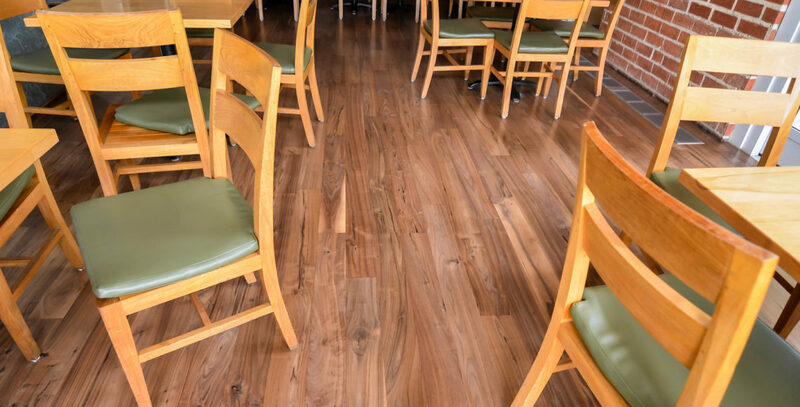 No matter which wood flooring you prefer, call in the experts of Sequoia Flooring to ensure it is done efficiently and in a timely manner. And if you aren’t sure, call us for a helpful consultation too! When you are looking to update the look of your kitchen, many people who adore wood flooring are hesitant to use it there. Where traditionally, the kitchens are equipped with tile and grout flooring, many are making the decision to install the wood flooring there. Wood floors in the kitchen are actually a smart move, as long as you are diligent with care and maintenance, the stunning presentation of the hardwood floors can last with the beautiful, durable and versatile addition inside the kitchen. With this in mind, we at Sequoia Flooring would like to share why the wood floor in your kitchen is a good idea. There are quite a few people turning to hardwood flooring in their kitchens. If you set out to do your research for how to redo your kitchen, you will likely stumble across a lot of people using hardwood flooring as a popular option for the flooring. There is a warmer feeling in the kitchen with hardwood flooring, which can help promote warmth on especially cold nights in winter. This option is a lot more gorgeous and of better quality than tile, linoleum, and vinyl. Combining different types of flooring is harder to do, the latest trends have been moving towards the kitchen being open. Wood floors are cohesive to any style kitchen and look amazing in most applications. Hardwood floors is an optimal solution for a flooring that will last. Where people’s top concern about hardwood floors in the kitchen is having them near moisture and plumbing. 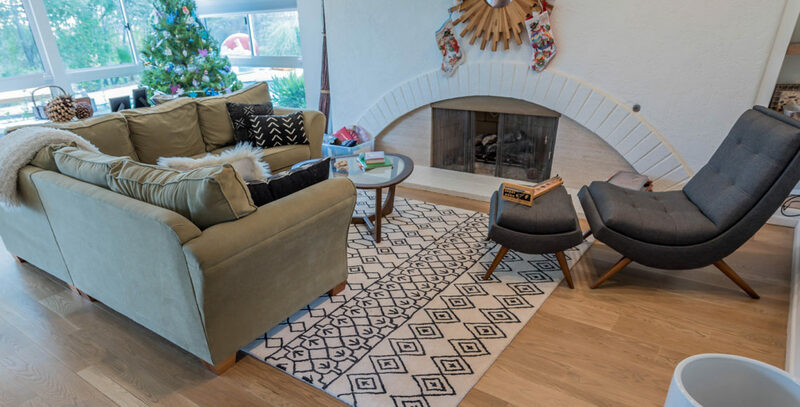 Moisture is bad for wood floors, as long as you immediately wipe up spills and utilize rugs and mats around water sources, you do not have to stress about the wood floor’s exposure to liquid. There are other options to improve the moisture protection as well. There are also some unexpected benefits of opting to install hardwood floors in your kitchen. Tile or ceramic flooring in the kitchen often produces pain in the back and knees. Avoiding these materials in the kitchen can spare you the pain. Hardwood floors do not require nearly as much time to clean them as tile and grout needs. Additionally, wood floors are a lot softer on the joints with daily foot traffic and standing as you cook and bake. Hardwood floors will also increase your home’s value. With so many colors, types, textures, and other options for your hardwood floor in the kitchen, you can find anything to match your tastes and complete the overall design of your kitchen. Once you have selected the hardwood flooring, call in the experts of Sequoia Flooring. Our professionals will ensure your installation is of high quality and is done correctly the first time. 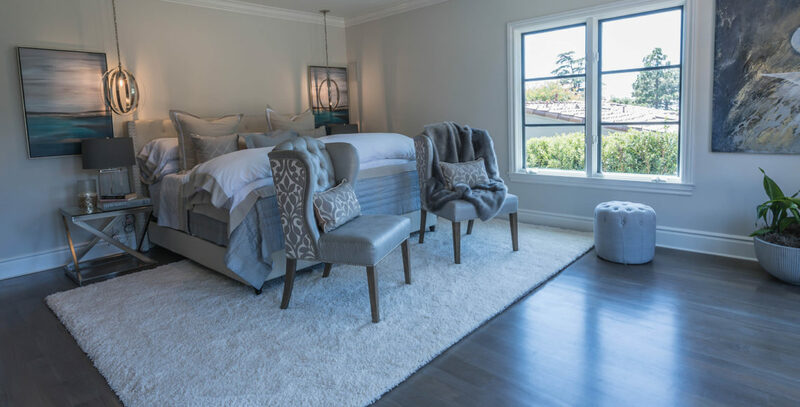 Our technicians are more than qualified and using high-end products and equipment, you can rest assured that no matter which hardwood floor you ultimately choose, it will be a sight to behold. Call Sequoia Flooring today to schedule your consultation. Having hardwood floors is a great addition to any home. There are lots of different sizes of planks, shapes and colors that you can choose from. The material that is used can be several different types of wood and when it is installed it is usually sealed so that it can be protected from damage. The hardwood floors are something that over time you will need to have cleaned as well as refinished on occasion. It is a good idea to know when you need to have your hardwood floors refinished. The damage to your hardwood floors usually will happen over some time and you may not even notice. That is why it is a good idea to know what you should be looking for. Hardwood Floor Water Damage: If you have water damage to your hardwood floors they will need to be repaired and even refinished. The water has a profound effect on wood in general and when it hits your floors you want to be sure that you clean them up as fast as you can. The water can still end up leaving damage to the floors that will send you scheduling hardwood floor refinishing. If the water damage is severe it can lead to the floor buckling and could also require you to replace some of the planks as well. Scratches on Hardwood Floors: Over time your floors will end up being scratched from every day wear and tear. The wood is prone to being scratched if you are not careful. There are many ways that your floors can be scratched and it is often in the areas that you have high traffic. If you are bringing in sand, dirt of dust on your shoes and walking in the house you could be creating fine scratches. When you move pieces of furniture that does not have soft coasters on them they can create small scratches all the way to large gouges. You want to make sure that you keep an eye on the amount of scratches that your floors have and when they start to be a problem it is time to have them refinished. Hardwood Floor Discoloration: The floors you have chosen for your home you picked based on several aspects. One is the size of the planks, the material that was used and the color of the finish. The finish with the sealant will create the color you want. Over time the color can be damaged from sun exposure, high traffic and more. When this starts to happen you might start to see discoloration of the wood and that is a sign that you need to have the floors refinished. Staining Hardwood Floors: The floors just like any other kind of floors they can become stained. This can happen when you spill certain liquids and other substances. If you see that your hardwood floors are suffering from staining it is a good time to have the floors refinished. This will help to remove the stains and balance the color back out. Sequoia Flooring can come out to your home and inspect the floors for refinishing needs. Call us today to talk to one of our experts.